Norwegian’s (NAS) passenger growth continued in August. Over 1.9 million passengers flew with Norwegian, up 14 percent compared with the same month last year. The punctuality remains high. During August this year, Norwegian flew 1,973,468 passengers, up 14 percent compared to the same month previous year. The total passenger traffic (RPK) was up 30 percent and the seat capacity (ASK) was up 31 percent. The load factor was 79.2 percent, down 1.2 percentage point from the same month last year. 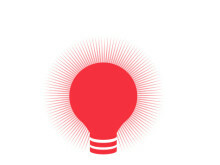 “I am pleased that more and more people choose to fly Norwegian. We know that people flying with us appreciate high quality and low fare prices. Once people have travelled with us, we know they will return. 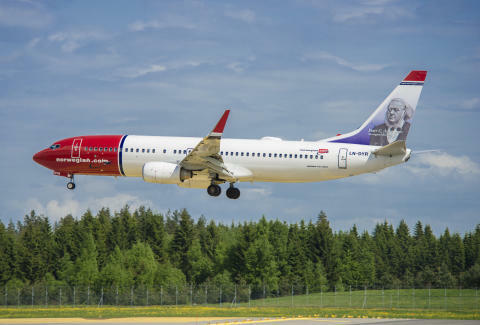 The traffic numbers this month are influenced by strong capacity growth, especially in new markets” said Norwegian’s CEO Bjørn Kjos. 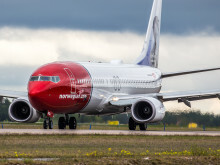 Norwegian operated 99.9 of its scheduled flights in August, whereof 89.3 percent departed on time. 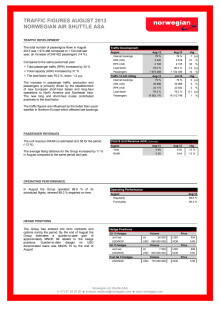 Please find more detailed figures in the pdf attached.